We had a really fun, really busy weekend! We celebrated our 5th anniversary, enjoyed Abigail Huff's 1st birthday party, and hosted our 5th annual Christmas party (with almost 50 people). Whew... I'm tired! 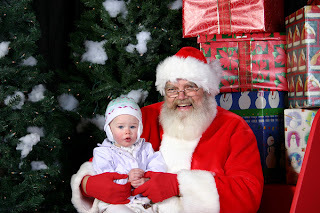 I'm going to do my best to post more about each of those later (and some fun pictures from the party), but for now I just wanted to get up Madigan's picture with Santa for 2007. This was taken last weekend at "Christmas Lane" hosted by a local church (it was pretty incredible - free food, pony rides, train rides, pictures with Santa, shows, etc). I wasn't sure how she would do with Santa this year (she has a bit of stranger anxiety these days), but she went right up and sat with him. No smile, but we're not going to be picky!